It's not often but sometimes you have to work with vCenter database. Usually it should be done only if you are instructed by VMware Support or there is VMware KB article (like this one http://kb.vmware.com/kb/1005680) solving your problem. Please do it very carefully in production systems. VMware vSphere admin veterans usually have experience with MS-SQL but what about vCenter Server Appliance (VCSA) with embedded database? It is not very different. VMware uses Postgresql database (aka vPostgres) so logically it is the same as in any other SQL database. I would say even easier than in MS-SQL but that's highly dependent on administrator background and previous experience. I'm probably biases due to my *nix history and open-source (GNU) general preference. Here are basic logical steps how to work with vCenter database. It's really good to know what tables are in the database. You need table names to compose SQL commands allowing you to select, insert and update data in the database. Postgresql have special DBA (database administrator) commands witch start with character \ (slash). You can list all DBA commands by sequence \? Update and delete statements can be composed in similar manner following ANSI SQL Standard. Postgresql is ANSI-SQL:2008 standard. That's it pretty easy, isn't it? Working with vCenter database is not daily task of vSphere admin however we all know that sometimes you can be instructed by VMware support or KB to change something in the database. Don't be afraid - it's easy. DELL NPAR is Network Partitioning of single 10Gb NIC or better to say 10Gb CNA (Converged Network Adapter). NPAR technology is implemented on modern Broadcom and QLogic CNAs which allows to split single physical NIC up to 4 logical NICs. More about NPAR can be found for example here or here. NPAR is not SR-IOV. More about SR-IOV is here and here. More logical interfaces partitioned from single interface which appears in the OS as normal PCI-e adapter. Switch independent solution. I'll explain what does it mean in the minute. I have seen several customers complaining about NPAR. NPAR is just another technology and each technology has to be used correctly with respect for what purpose it was invented and designed. I have depicted NPAR architecture in the drawing bellow. Let's describe the picture. On the picture you can see one physical server with ESXi hypervisor and two CNAs. Each CNA is divided into four logical partitions where each partition act as independent NIC with unique MAC address. You can see two physical wires interconnecting CNA ports with switch ports. Inside each physical wire are four "virtual wires" interconnecting CNA logical interfaces with single physical switch port. That's important!!! Four virtual ports on CNA are connected into single switch port. You can imagine it like four connectors on one side of the wire and just single connector on the other side. The benefit of this architecture is switch independence. The drawback is that ethernet flows between NPAR interfaces on single CNA port will fail. 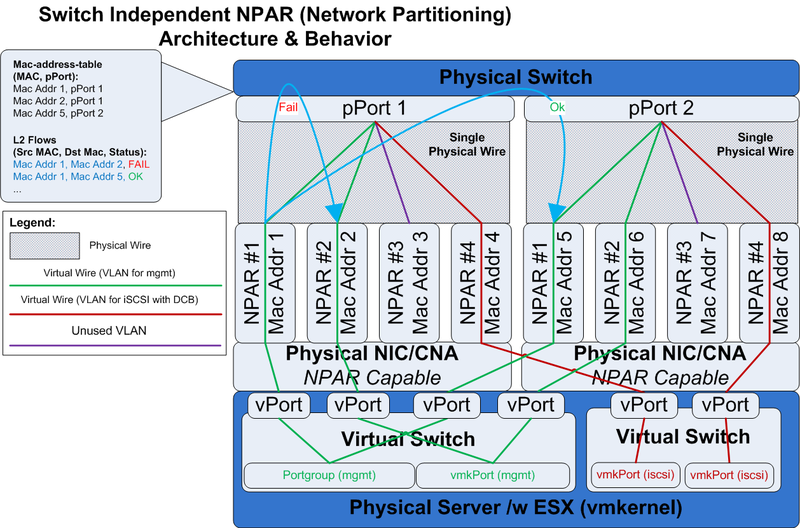 So with this information in the mind let's explain NPAR architecture behavior in bigger detail. Physical switch will never forward Ethernet frame back to the port from which the frame is coming. So, if src-mac and dst-mac is on the same physical port switch (these are entries in switch mac-address-table) the L2 communication will be broken. That’s standard Ethernet switch behavior. So what happen in NPAR architecture where are 4 virtual cables (NPAR interfaces with independent MAC addresses) connected into single physical switch port? No communication. It is shown on picture below. These solutions multiplex Ethernet on both sides of the wire. I have hands-on experirence with CISCO VN-TAG so I can admit it works correctly but I have never tested HP VEPA. NPAR is relatively good technology to separate and prioritize Storage and Ethernet traffic on unified (converged) ethernet networks. It can be also used to separate and prioritize L2 traffic. But it will not work if L2 communication between logical NPAR interfaces are required. vCenter in VM <-> ESX vmkernel management port in the same L2 segment but different portgroups routed through separated NPAR interfaces (uplinks) as depicted above.